By CPO's standards the repertoire given here is pretty standard fare. This is the second disc of Richard Strauss from these artists for the label - I have not heard the previous volume, which included the Duet-Concertino and Der Bürger als Edelmann. So even if the these two early orchestral works by Strauss are far from unknown in the catalogue, the intelligent coupling of them as here is as far as I can tell unique. Therefore for the judicious collector, keen to fill gaps but not at the cost of another Don Juan or Also Sprach, this could be a tempting proposition. The last time I reviewed Aus Italien for this site - just over 3 years ago; François-Xavier Roth conducting the SWR Sinfonieorchester Baden-Baden und Freiburg for the hänssler label - there was just that problem; the generous Also Sprach coupling almost proving a hindrance. The fascination here is to be able to hear the development of the composer in just four years, from the enjoyable but rather derivative Op.8 of the Violin Concerto to the still immature, but far more individual and impressive Op.16 of Aus Italien. Between those two opus numbers only really the Horn Concerto No.1 stands out as having any hint of the mature composer. The violin concerto is a substantial work, running to over half an hour in the three traditional movements. Indeed, this must be one of Strauss's most traditional works and certainly one, where the influence of other Germanic composers is most evident. The famous Bruch G minor Concerto would seem to be the most obvious and undigested one, as well as a muscular take on Mendelssohn's music in general. The soloist here is the leader of the orchestra, Robert Kowalski. His playing is predictably fine and, to be clear, Strauss writes a consistently demanding and virtuosic part. That said, both of the soloists in the other three recordings I am familiar with manage the part with even sweeter tone and no apparent strain whatsoever. They are Ulf Hoelscher, as part of the famous traversal of the Strauss orchestral works by Rudolf Kempe in Dresden for EMI/Warner, Pavel Šporcl live in Prague on Supraphon, interestingly coupled with the Korngold, and lastly Ingolf Turban in Bamberg, with an equally fascinating combination of the Bruch 2nd Concerto and the Busoni. In isolation both in terms of the playing offered or indeed the couplings, I would turn to any of those three performances before the new one, with Turban possibly the first amongst equals. But that said, as mentioned before, if the current coupling appeals, this is still a very good performance of the concerto, so by no means should the above comments rule it out of court. 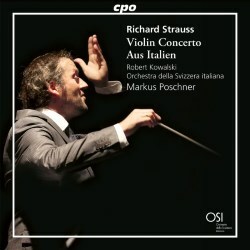 Conductor Markus Poschner is a sympathetic Straussian. In both works he is willing to linger lovingly in the lyrical passages and in this he is well supported by the sensitive playing of the Orchestra della Svizzera italiana. Musically, I find the opening movement of the concerto to be the least successful. This is in the sense that Strauss seems to be going through the Germanic/Romantic motions with grand gestures and fairly empty rhetoric, and at sixteen minutes it frankly outstays its welcome. Praise to the performers that they make it as convincing as they do. The central Lento ma non troppo is again very Bruch-nerian(!) but appealing all the same. Turban takes on board the "ma non troppo" marking, with the music flowing forward by a good 30 seconds over the movement's course - probably to its benefit. The closing Rondo-Presto is the most original section - bright-eyed and vivacious. Turban catches its capricious nature even better than Kowalski, but this is a close-run thing. The CPO recording - in standard CD format only - is good throughout the disc and the balance between soloist and orchestra is very well managed. The occasional soloistic sniff is heard, but the violin is not unduly prominent. I have always liked Aus Italien more than received wisdom suggests I should. In its four movements it is in effect a programme symphony with Strauss providing - for the only time in his career - a detailed commentary on the work. The leap forward he makes as a composer in every regard from the earlier concerto is evident from the very first bars. Where the early work is derivative, the latter immediately creates a picture with a beautiful orchestral "dawn", which leads to the first of so many great orchestral melodies he wrote in his career; in this recording track 4 at 2:57. This is Poschner at his finest. It is a really beautiful traversal of this quietly dignified theme, beautifully phrased by the orchestral strings. The recording allows the accompanying harp figures to be heard without undue prominence, and then when the melodic lines are doubled in the horns the addition is again clear. Neeme Järvi for Chandos takes a full minute and a half less than Poschner, with Kempe almost exactly in the middle. The aforementioned Roth takes longer still - possibly stretching the music just too far. I have to say I like Poschner very much in this movement, as he finds an excellent balance between lyrical reflection and allowing the music to flow. The second movement - In Roms Ruinen - fulfills the symphonic role of the scherzo. Perhaps this is an example of Strauss's relative inexperience - the scale of the movement, making it in most recordings nearly the longest part of the work, seems disproportionate for its role. Mention here of Bertrand de Billy's recording with the Vienna Radio Symphony Orchestra, who manages the quickest opening movement of all - 8:41 as well as an implausibly fast third movement - 9:56 - which leaves this scherzo as the longest section of the work at 12:25 by some two and a half minutes. Järvi with the SNO for Chandos and Luisi in Dresden for Sony are quicker than Poschner in this 2nd movement, too; 11:14 and 12:08 respectively compared to 12:36, and their characterisations of the movement are generally more muscular and athletic. Again the players of the Svizzera italiana are very good, but I do prefer here the bite found in both those other performances, although it has to be said that Järvi verges on the breathless. Worth noting here, perhaps, how few of the conductors well-known for their Strauss interpretations recorded this work. No Reiner, Solti, Karajan, Szell or Ormandy, Maazel or Mehta for starters. In fairness, the one great Straussian who did - Kempe - is almost identical in timing to Poschner in this movement (Zinman too - but I like his Strauss discs a lot less than many others). Prior to Kempe only Clemens Krauss seems to have deigned the work worthy of his attention in the recording studio. The slow movement Am Strand von Sorrent plays to the strengths of these interpreters again. Some may like or prefer de Billy's dry-eyed unsentimental approach, but I find Poschner’s very sensitive and deeply affectionate account again very impressive, aided as before by the very good CPO engineering. This really does allow the filigree writing - tricky to bring off well for the orchestra - to register effectively. The melting clarinet duet around 3:18 is beautifully played, although this is a moment where I am not sure anyone has ever surpassed Kempe and the stunning Dresden Staatskapelle for subtly phrased nostalgia. The use of Funiculi funicula as the finale's main theme - Strauss mistaking it for a folk-song - does undo much of the poetry that precedes it. The approach for any performer has to be to play it as if it were a theme of towering genius. Poschner sets off in a suitably robust and confident manner, with the orchestra strings making light work of the awkward passage work. Strauss does not help his own cause with a rather too convoluted development of the theme, which in turn then gets hi-jacked by "reminiscences" of the earlier movements. In line with how he viewed these sections previously, Poschner pulls the tempi back, which makes for lovely nostalgic music, but I do feel this risks disrupting the musical momentum here. Again Kempe is near ideal at finding a balance between backward looking nostalgia and forward flow. That said, Poschner's overall timing for this movement is only seven or so seconds slower than Kempe and actually quicker by a hair than the dry-eyed de Billy and driving Järvi. This is in the main due to the fact that in the closing pages Poschner pushes the music through with a sudden, rather exciting burst of adrenalin. Praise to the Svizzera italiana players that they stay completely on top of this head-strong dash to the finish line. In the context of this being a confidently youthful work, I find this to be a very valid and effective conclusion. It might seem like a too easy option for a reviewer to say "Kempe is very good" - but he really is. However, that said I did enjoy this new version a lot. Of the recordings I know in the digital age, this is probably the one I have enjoyed most alongside Luisi. Thank goodness CPO now provide useful liner notes, which, allied to the quality of the engineering and production makes this a very appealing package. The concerto receives a very good performance. I am not sure any version makes me think that it is a great work, since it palpably is not. There are many performances I have not heard - from Hyperion, Chang with Sawallisch on EMI/Warner, Belkin on Decca, just to name some. Of those I do know this is good without being the best. But with excellent engineering, insightful interpretations and a useful coupling this is a valuable and generously-filled disc for those expanding their knowledge of the young Strauss.